Today it’s all about quick and easy! 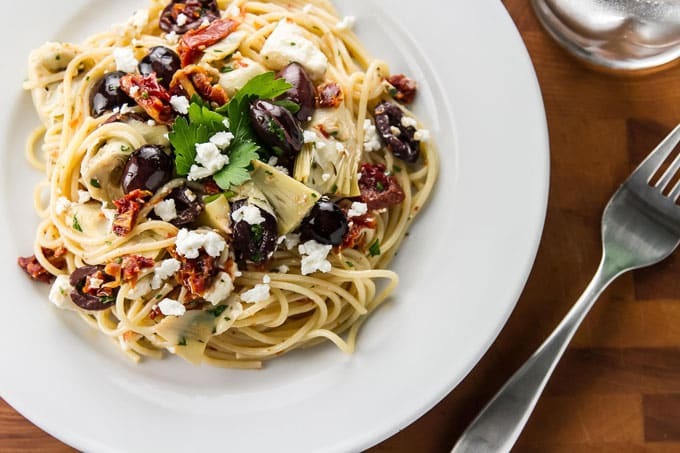 As in, open some jars, boil some pasta, and stir it all together – seriously, it doesn’t get any easier than this 15-minute Mediterranean pasta with olives, artichoke hearts, sun-dried tomatoes, and feta. I think I’ve mentioned that, for some really strange reason, we got a puppy. We got a puppy. Those words have finally sunk in two and half weeks after Feynman, our little bundle of golden retriever puppy joy, arrived home. Right now, as I type this, he’s sleeping and I’m really hoping the gentle clickity-clack of my typing doesn’t wake him because I am enjoying the peace – I love, love, love when he sleeps. When his little eyes are closed and he’s laid out flat on his tummy with his little puppy legs splayed out (is there anything cuter?) it means he’s not running around, nipping at our clothes, legs, fingers, or my ponytail. Sleep means I can take my eyes off him and not worry about looking up and seeing random things hanging out of his mouth, the sight of which sends me flying ready to retrieve whatever foreign object has made its way into his mouth. I’m like the Jaws of Life for puppies – I can get in there and retrieve the object before he even knows what happened. Sleep means I can power down the newly discovered internal radar that alerts me (most of the time) when it’s time to go outside. “Outside? Outside?” I’m pretty sure he thinks that’s his name because I when I call him Feynman it barely registers, but “outside?” gets him all excited and wiggly. Gotta work on the name recognition. And walking on the leash. And the nipping, although he is getting better thanks to our “ow, ow, ow!” technique. Yes, it’s a thing. Oh, but there’s so much good stuff, too – we taught him to share “kisses”, which is basically little puppy licks on our hands instead of sharp puppy bites. He sits on command unless he’s totally distracted, which is about 80% of the time, but – yay! – progress! And, of course, the cuteness. 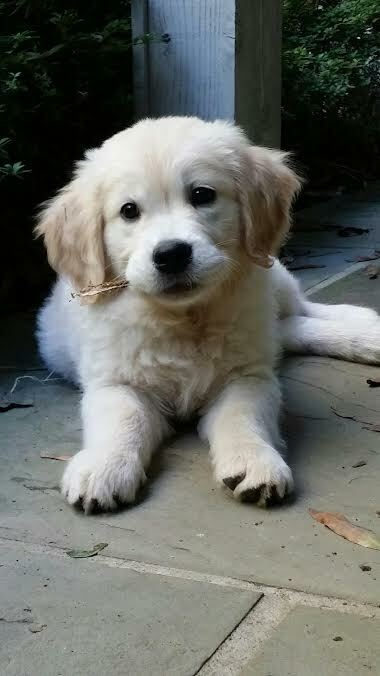 His cute, happy, curious little self makes our hearts melt. I promise I won’t turn this blog into Our Puppy Update, but I needed to share because – wow – life sure is different. With all this change we’ve struggled to maintain our own routines, one of which is dinner. As in, what the heck are we having tonight? 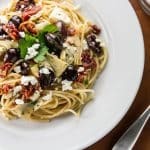 Let’s turn our attention back to this 15-minute Mediterranean pasta: it’s quick, it’s easy, and it’s full of delicious things like olives, sun-dried tomatoes, and artichoke hearts – all sorts of good things that can just hang out in the pantry until you need them on those crazy busy nights. There are a few fresh ingredients – stuff I think is always good to have on hand like garlic, parsley, feta cheese and lemon – and when you put it all together you get a dinner that hits the spot without taking up tons of time. We all can use some time, right? It doesn’t get any easier than this Mediterranean-inspired pasta. With just a few simple pantry ingredients, a couple of fresh ingredients, and 15 minutes this easy dinner is ready to serve. Bring a large pot of water to a boil. Add the spaghetti and cook it according to package directions. While the spaghetti is boiling, add the garlic and olive oil to a small pan. Heat the oil over medium-low heat and let the garlic gently cook in the oil, for about ten minutes. Adjust the heat to maintain a low simmer, you don’t want the garlic too brown too quickly. After ten minutes discard the garlic and turn off the heat. Once the spaghetti is cooked, drain it and return it to the pot. Add everything, except the feta cheese, to the pot with the spaghetti and toss it all to combine. Add 3/4 of the feta, reserve some for serving, and give it one more gentle toss. Serve right away with the extra feta on the side. Oh! I meant to add – is there anything you’d recommend substituting for the olives to still have that tangy flavor? My husband hates olives and I can’t get him to eat them, sadly. I love them! 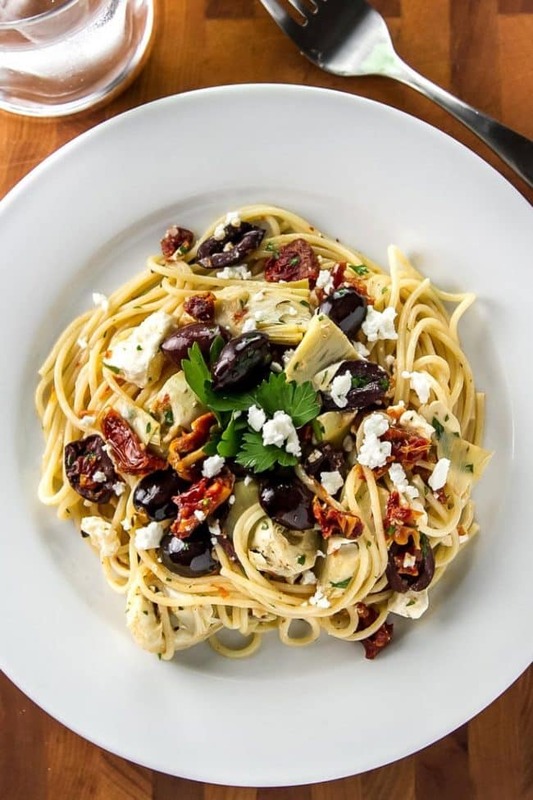 I want to make this again without the olives but I know I would miss that flavor! I absolutely loved this recipe! It was SO easy and SO delicious!!! I am new to cooking and I seriously thought I’d just ordered a pasta dish at a fancy Italian restaurant or something. I couldn’t believe something I made tasted so delicious. It definitely took me 30 minutes instead of 15. I spent 15 minutes waiting for the water to boil! But I loved that the hands-on and prep time was so short. After dinner I got the munchies and ate the leftovers cold and it was really good cold too!!! Thank you for such a delicious, quick, and easy recipe! The recipe was very tasty! But, as a college student barely learning to cook for myself lol it was sort of difficult to follow along. I understand 1. But, I was lost by 2. So I heat up the oil and the garlic but then it doesn’t say anything else about the rest of the ingredients such as the artichokes and the tomatoes and the olives. I didn’t want to throw them in the pot of the pasta without heating them up first so I heated them in the oil for a bit then threw them in the pasta and tossed. After I sorted that out, it was a very good recipe! Delicious! I used drained canned artichoke hearts, a tiny drizzle of sundried tomato oil, and some basil, oregano and crushed red pepper. I also added some fresh baby spinach. This has become our favorite pasta dish! I make this recipe frequently. I also add fresh basil or the refrigerated kind in a tube. I have also thrown in green onions if I have some. And yes I also like the leftovers cold. Great recipe! I pride myself on enjoying cooking/making up my own recipes/friends always wanting my recipes. So I think I’m a good judge 🙂 LOL This was delicious. Id think that the commenter above that didn’t like the recipe must not like one of the ingredients. They are pretty strong flavors. My husband and I love everything in this dish so we LOVED it! Thank you for an easy, flavor filled recipe. I did do a LITTLE lighter on the evoo and rinsed the sundried tomatoes a bit because I didn’t want it to be too oily. Oh and added a bit of pepper because we love it. Thanks a ton! Ever serve it as a cold pasta salad? I haven’t served it chilled as a pasta salad before – let me know if you try it! Made this 3x now since I Pinned it. My family loves it! Thank you!!! P.S. I think you have to use good quality ingredients to make this recipe work. The recipe is so simple that you rely on them to make a really good dish. I tried this recipe and it was’nt so good :/ i’m a little bit desapointed..
I’m so sorry you didn’t enjoy it – let me know if there was anything in particular that didn’t work for you. This pasta looks so delicious!! Anything with artichoke hearts and I am so there! Seriously your puppy is so adorable! Congratulations!! As for this pasta, it looks so amazing and super simple!